Today (7 June 2018), 45 individuals reported themselves to police at Nang Lerng Police Station for being notified of charges in relation to the pro-democracy demonstration calling for elections during 21-22 May 2018. One of them is TLHR documentation officer who was assigned to monitor and observe the assembly at Thammasat University and in front of the UN ESCAP building in Bangkok on 21-22 May 2018, despite having clear identification as TLHR staff. 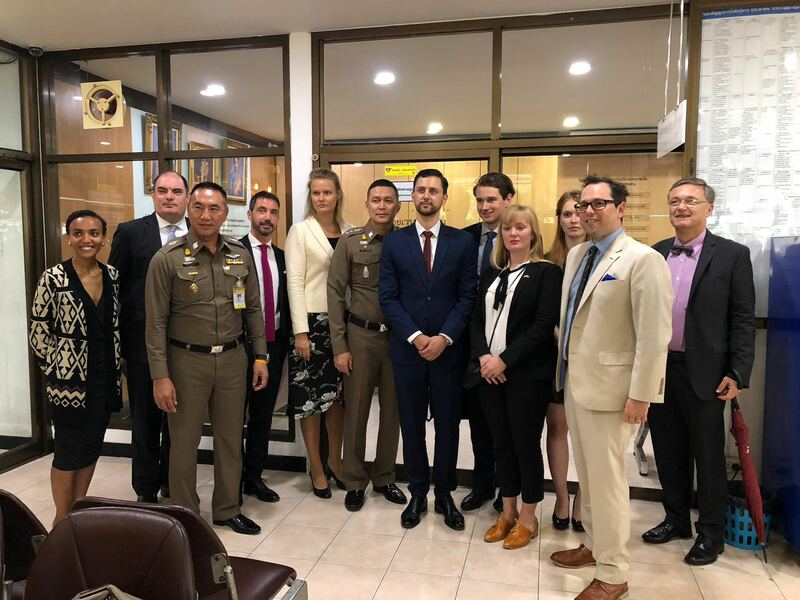 7 June 2018- Diplomats and representatives of embassies in Thailand: the EU Delegation, US, UK, Finland, Germany, Netherlands, Belgium, Denmark, France, Switzerland was present at Nang Lerng Police Station to observe the case against 47 people charged as part of We Want to Vote movement over public assembly demanding elections on 22 May 2018. 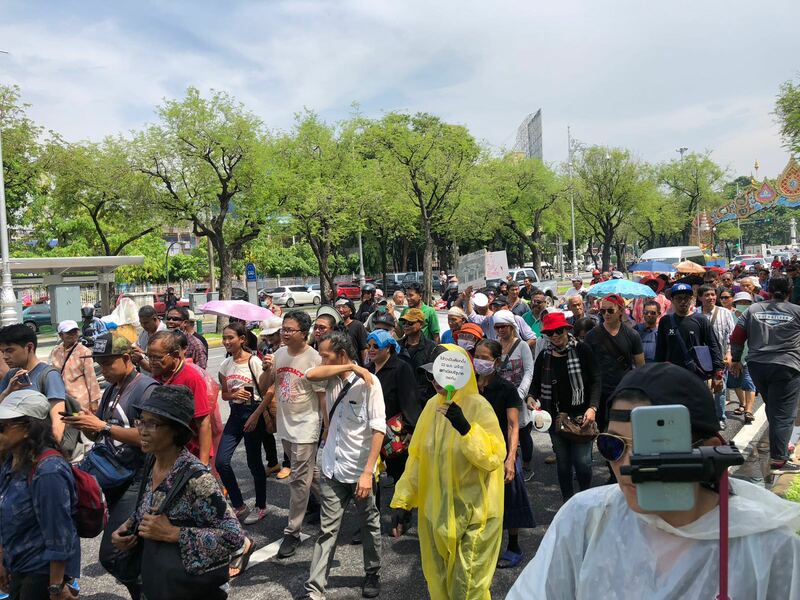 Earlier on 29 May 2018, Thai police issued summons to at least 47 more individuals to be charged in addition to 15 pro-democracy activists who were already charged by police on 22 and 23 May 2018. 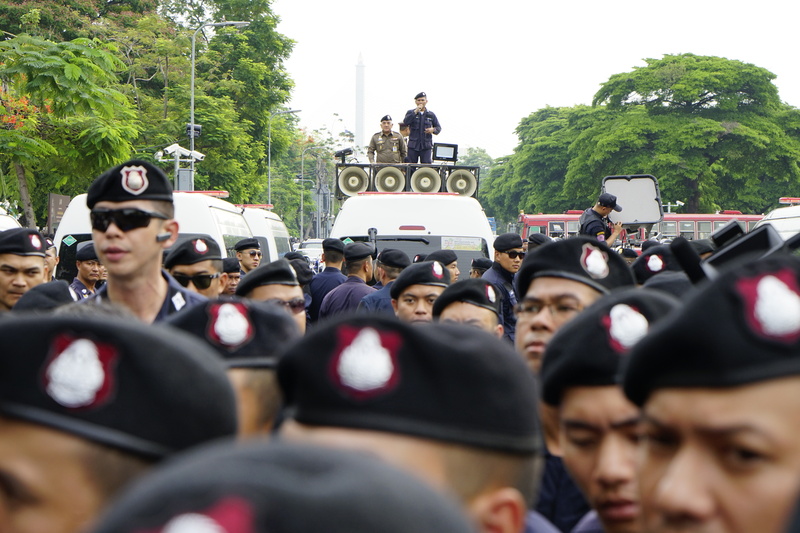 According to police, 41 people are charged with violating the HNCPO No 3/2558 (ban on political gathering of five people), violating an official order to stop gathering, the Public Assembly Act and the Road Traffic Act. 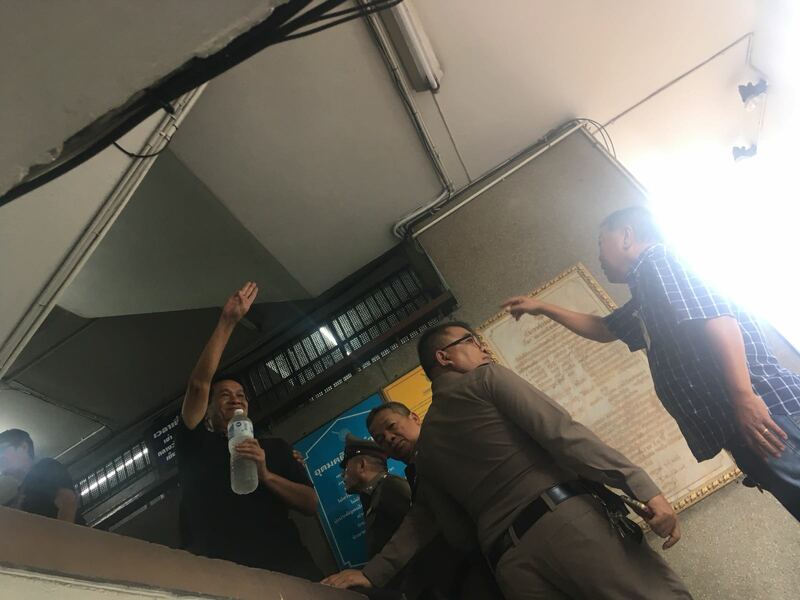 The other 6 are additionally charged with sedition, apart from violating the HNCPO No 3/2558 (ban on political gathering of five people), violating an official order to stop gathering, the Public Assembly Act and the Road Traffic Act. In terms of TLHR staff, Ms. Neamsub denied the accusations and gave a statement to clarify and explain about her roles as TLHR staff who was assigned to observe, monitor and report on the demonstration on 21-22 May 2018, referring the TLHR Letter, dated 31 May 2018, re Ms. Neeranuch Neamsub’s roles as observer in a public assembly, submitted to an inquiry official in charge of the case against pro-democracy activists participating in the demonstrations during 21-22 May 2018 and copied to 1. Commissioner General, the Royal Thai Police and 2. Director General of the Rights and Liberties Protection Department The letter states that during 21-22 May, 2018, Ms. Neeranuch Neamsub, together with six other TLHR staff members, had been designated by TLHR to observe the demonstrations of the pro-democracy activists. They were there to monitor how the situation unfolded and how the law enforcement officials responded to the situation. They were not there to participate in the demonstrations. 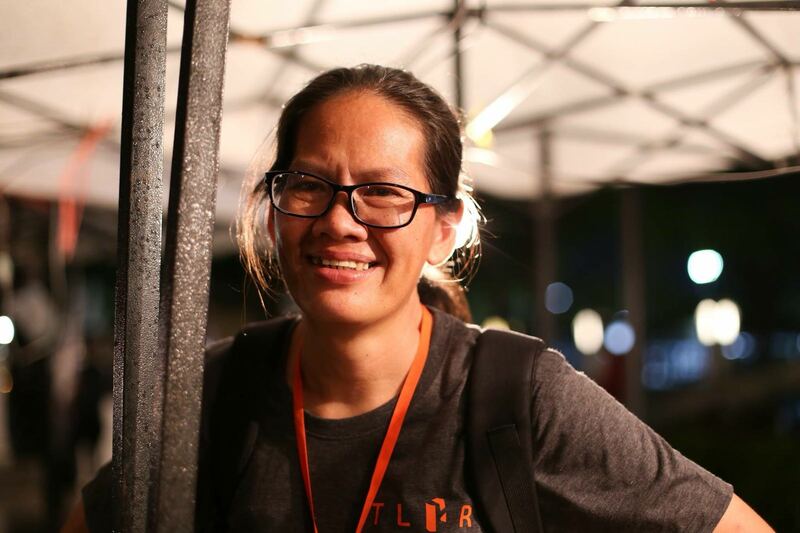 During the mission, all of TLHR staff wore their name tags to identify themselves and wore a gray T-shirt with the acronym “TLHR” (“Thai Lawyers for Human Rights”) screened in front and “Thai Lawyers for Human Rights” in the back. 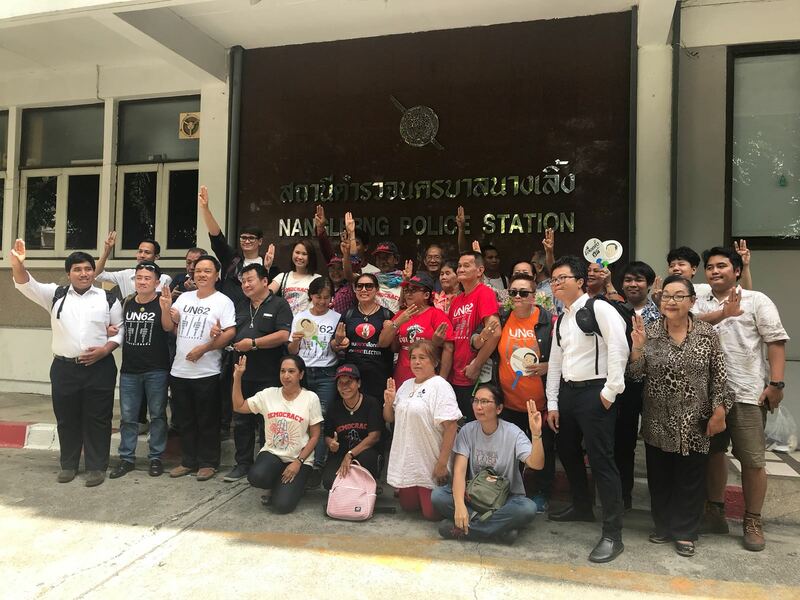 After the charging, police released all of 45 who reported themselves today and required them to report themselves at Chanasongkhram Police Station on 29 June 2018, 10;00 am, to hear if police have concluded their opinion on the case and would deliver the case file, with the accused, to public prosecutors. This would be a total of at least 62 people who are facing legal actions in this case, for exercising their freedom of peaceful assembly to call for elections and democracy. On 22 May 2018, at 07.30, the 15 human rights defenders who are part of the newly formed ‘We Want to Vote Movement’ gathered as part of a group of about 300 people in total at the Thammasat University’s Tha Phrachan Campus, having camped there over night, with the intention of marching to Government House in Bangkok to demand the end of military dictatorship that began with the coup in 2014 by the self-proclaimed National Council for Peace and Order (NCPO), and elections within this year as previously promised by the head of the NCPO, General Prayuth Chan-ocha. They were blocked by rows of around 2000 police at the main entrance of the university. Police arrested ten of the human rights defenders at a checkpoint to block the march, near the UNESCAP building. They arrested the other five at Thammasat University. Under orders from an official of the NCPO, police on May 22 and 23 charged the 15 with sedition, violating the junta’s ban on political gathering of five persons under the Head of the NCPO Order (No. 3/2558), the Public Assembly Act 2015, and the Road Traffic Act. They could yet be charged with additional offences. At the time they were held in police custody. On 24 May 2018, after detaining them for two nights the police took the 15 human rights defenders to Bangkok Criminal Court around noon. Police submitted a request to the court for 12 days of further pre-trial detention while TLHR lawyers representing 14 of the 15 submitted a motion to object to the police request. At 15.20, the Court dismissed the motion, but after TLHR lawyers were able to secure surety for the accused to obtain bail the court granted bail at 17.20. As a result, the 15 human rights defenders had to place a cash total of THB1.5 million (USD46,800) – THB100,000 per person. 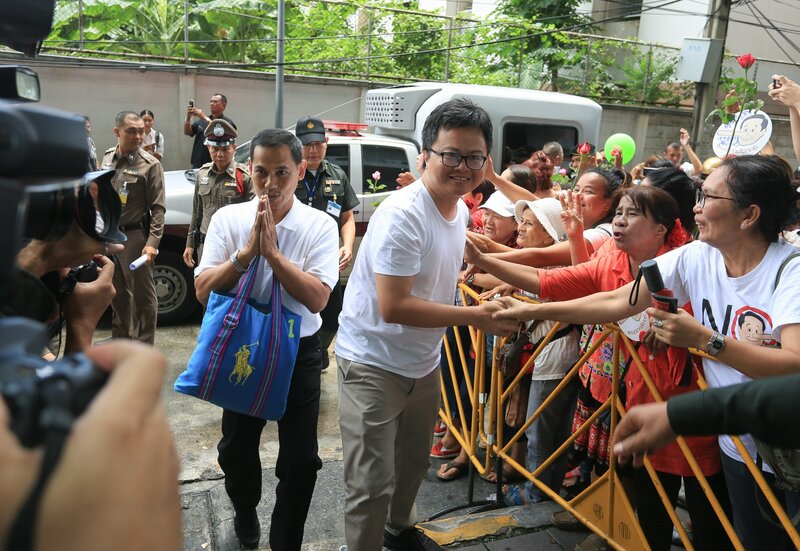 The court also imposed conditions that breach international human rights standards, namely, prohibiting the accused from organizing or participating in an assembly that might violate domestic law, which itself is inconsistent with Thailand’s obligations as a State party to the ICCPR. The charges against the 15 human rights defenders include Section 116 of the Penal Code or ‘sedition’, Section 215 (ten persons upwards being assembled together to do or threaten to do an act of violence, or to do anything to cause a breach of the peace), and Section 216 (refusing to disperse after being ordered so by competent official); as well as violations of the Head of the NCPO Order no. 3/2558, article 12 prohibiting a political gathering of five persons and more, violations of the Road Traffic Act, and violations of the Public Assembly Act 2015. If convicted of all offences brought against those 21 charged as leaders or organizers, the accused face up to seven years in jail. Whilst those 41 charged as participants in the assembly could face up to three years in jail if found guilty by the court.